The hotel is ideally located just off the M1, 45 minutes from Dublin Airport and 45 minutes from Belfast Airport. It is exactly half way between Irelands two largest cities, Dublin and Belfast. 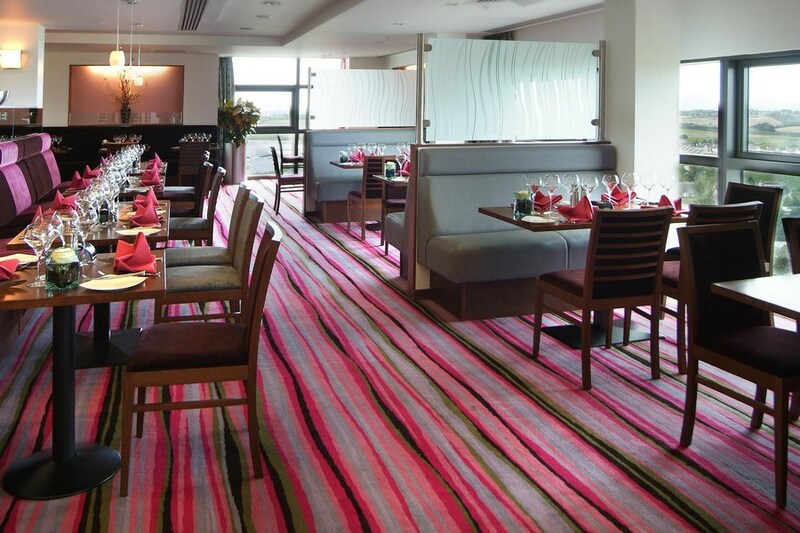 The hotel has a 14 story high with roof top restaurant with breath taking views of Dundalk Bay. From the South: 45 minutes from Dublin Airport Follow signs for M1 North/Airport/Belfast. Continue forward onto the M1 (signposted Belfast). Leave the M1 at junction 16 signposted Dundalk (South). Then at roundabout take the 3rd exit onto the N52. Continue straight through two set of traffic signals and the Crowne Plaza Hotel Dundalk is on left hand side. Close to Carlingford and other local attractions such as Dundalk all weather race track, the Crowne Plaza provides the ideal accommodation for a weekend break. fair, stayed 1 night had dinner on that night in the bar , ordered and paid for drinks when we ordered our meal, food was excellent but the staff serving it weren't in tune with each other as we left the bar after the meal a waitress came running after us accusing us of not paying for our meal as we giving our room number when we entered the bar they should have known we had this included in hotel stay. said it at reception following morning and was offered complimentary tea as apology .a bit of put off really! Great deal for 4adults and 3 kids.We were given adjoining rooms,which were very modern and good sizes too.Lovely food and amazing staff,couldn't have been more helpful from check to dinner and of course breakfast,despite the fact there were a lot of rug rats running around,3 of them mine,they continued to smile.Would go back again! This was our 2nd time to visit the Crowne Plaza Hotel and it didn't disappoint! Staff are friendly and efficient. Rooms are a good slze and were spotless, we were on the 8th floor and it was lovely and quiet. Breakfast is served on the 13th floor where you get a fantastic view out to the sea and surrounding mountains, perfect way to start the day. Lovely hotel and perfectly placed to visit surrounding areas of Carlingford, Newry and on to Belfast. We will be staying here again! My husband & I stayed here for one night on the Dinner, B& B offer in January 2014. Every aspect of our stay was most enjoyable & we were pleasantly surprised to discover Wi-Fi is now available throughout the entire hotel.Staff were most helpful & the breakfast was extensive for both Continental palates ( it included pastries which another review said it did not) & the Full Irish was enough to satisfy the hungriest individual, with very tasty sausages ( again mentioned negatively by a previous guest).We would heartily recommend this hotel to the most discerning customer. We stayed at the Crowne Plaza in Dundalk for one night. I have to say that everything from the food to the room was excellent. The staff were very helpful and friendly, cannot fault this hotel in any way. Excellent hotel, everything perfect. We stay here twice a year & it is always top class. Rooms spacious & beautifully decorated, very comfortable bed for a good nights sleep, evening meal delicious as buffet breakfast top class. We will keep coming back! Enjoyed my stay staff very helpful and friendly, The food was excellent. The room was top class I will definitely come back again. Found the hotel very friendly and clean! Dinner in the restaurant was lovely and cooked really well on both nights. Only had dinner up in the room 1 morning and it was very fresh. Would most defiantly recommend this hotel!! Wonderful hotel, staff very friendly and the most comfortable beds ever. wonderful hotel...friendly staff ....amazing bed so comfortable you dont want to get out of it ! excelent value for money..
Lovely 4star hotel, ideal for Adults, Great views. Only spoiler, rooftop restaurant closed on Sundays and Mondays. Fab hotel food was delicious. Staff very friendly and helpful room view was lovely decor of the room and bed so comfie and welcoming. Resturant view on 13th floor was amazing and it was snowing monday morning added to it. Personally only dropping at star becuase there was no pool or spa facilites a crying pity other than that perfect hotel but found a fab place mizu 5 mins in dundalk town. We stayed in the Crowne Plaza for 2 nights in the end of October. Checking in was very efficient and reception staff very helpful and friendly. Our room was spacious, very comfortable and clean. We didnt eat in the evenings but breakfast was lovely with a great choice of foods available. Only one member of staff served tea/coffee at breakfast time she was very busy but was cheerful and helpful (Lea). Free large car park and all mod cons in room. It is a lovely hotel we have stayed there 3 times and will definately return. Lovely hotel, some excellent staff. I booked a one night B&B with evening meal based on my previous enjoyment of the hotel and it's 13th Floor Restaurant. On arrival we were informed that the top floor restaurant only opens Thurs to Sat and we would have to eat in the bar. To be honest I was very disappointed cos had I know this I would have booked a different date. The food in the bar was not great, my partners fish was inedible and had to be returned, my burger wasn't great either. My educated guest would be that they were reheated. In the waiters defence he didn't charge us for the fish but this didn't make up for the fact that my partner had no dinner. Although the bar was very quiet some customers found it difficult to get served cos some of the staff were far too interested in watching X factor on the tv's. We ordered breakfast to our room, unfortunately they only supplied one set of cutlery and by the time it had been replaced (10 minutes) my already luke warm breakfast was cold. I did mention all of the above to reception on my way out and she asked if I'd like to make a formal complaint, I chose not to because by this time I was just fed up. Lovely hotel, great beds, some lovely staff but lots of room for improvement. 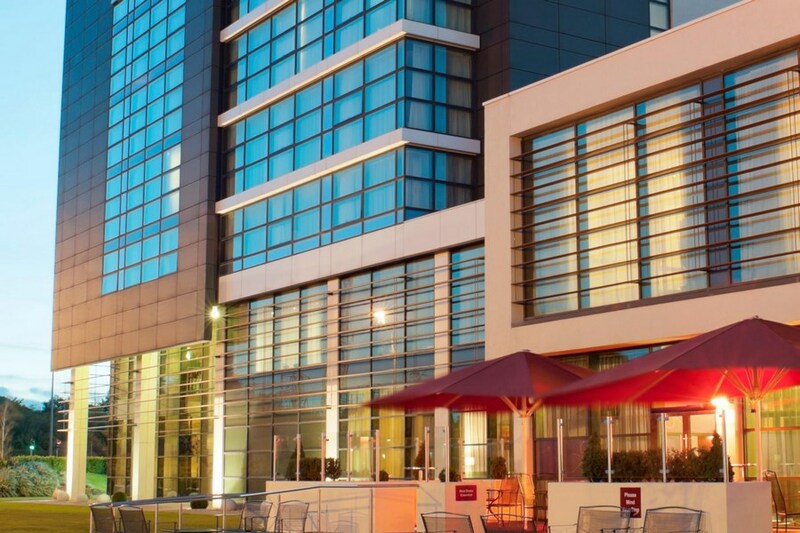 Stayed as a group of 4 young couples in the Crown Plaza dundalk for 1 Night Dinner & Breakfast 6th October, I have nothing negative to say about the Hotel. Room was modern & Very clean, restaurant is on 13th Floor of Hotel with beautiful view, Dinner menu had ample choice & when it arrived was delicious, which was not expected as dinner was part of our value deal, service was 5 Star. Music in the bar until very late, Will definately be returning, the rest of my group would too. Excellent hotel. Staff very friendly and standard of food in the beautiful restaurant on the 13th floor was possibly one of the best experiences we have ever had. Fantastic value for money. We will be returning soon again. Highly recommend this hotel. Fabulous hotel at a great price! Excellent service, lovely room, very clean. Couldn't ask for more. Would highly recommend it! The hotel was great value. Spacious bedrooms. Staff were very friendly. Great room; Great staff; wonderful food and overall a fantastic experience. Would definitely go back. We had a great break and the hotel was everything was just as we expected , but my wife found the bed a bit to high for her to get into as she is only 5 ft herself . so a bit of thought is needed for people of that height using your hotels. we were part of a group up for a wedding in Drumconrath in Co Meath and the reception in Ballymasclanlon House Hotel ,so your Hotel was perfect for reaching both on the day. Thank you for a great stay. Mr & Mrs James Hannigan. Very impressive hotel. Stunning views of Dundalk Bay and Cooley Mountains from 13th floor restaurant. Staff helpful and friendly. Accommodation excellent and food very good. No complaints. Just back from 2 nights at the Crowne Plaza Dundalk. Lovely time. Excellent room overlooking the bay. Bed was so comfortable. I had a meal each evening in the restaurant on the 14th Floor and found the food and service also excellent. We made it a point to compliment the chef on the first evening. I would recommend this hotel anytime. We picked this hotel from a list of hotels available for the May bank holiday weekend. We were very impressed. We had dinner in the restaurant on the 13th floor. Wonderful place, you could see the mountains an the sea, even though it was a dull evening. We had two courses - dinner and dessert - as we had been a bit greedy at lunchtime. We both had hake which as presented in a most attractive and delicious manner. Dessert was finger-lickin good. Breakfast was more than adequate - a selection of cereals, fruit, yogurts, cheese, cold meats and a beautiful full Irish for those who wanted to indulge. Excellent breads and pastries were also available and the chef was on hand to fry eggs fresh from the pan. The bedroom was as good and better than we have found in Ireland or on our many trips abroad. Excellent broadband and a T.V. with all the stations one could ask for. We will be back. Spent a night in the Crowne Plaza on May 5th 2012. Easy to get to location. The staff were very friendly and the food was excellent. We spent some time in the bar which had a really great atmosphere. Will go back again some time. 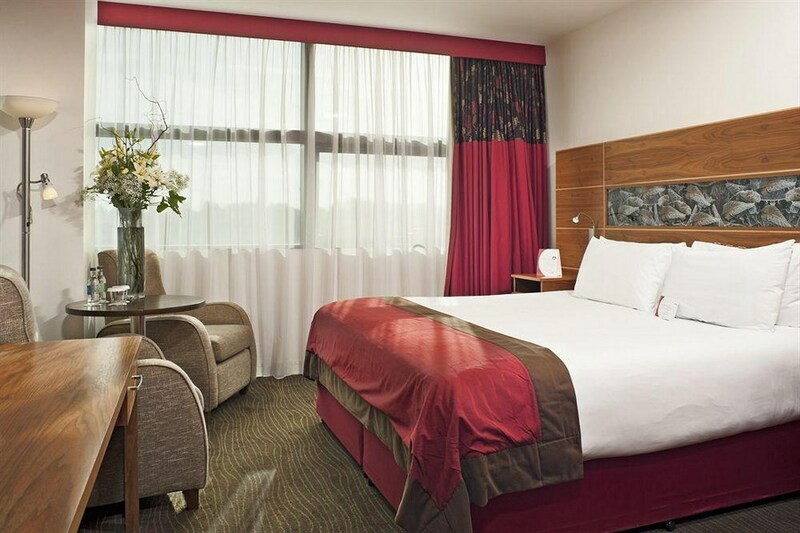 I stayed at the Crowne Plaza Dundalk on 27th April for two nights with my husband and two children. The reception staff were very welcoming, efficent and helpful. Our room was large, extremely comfortable and bathroom was modern with bath and seperate shower. The restaurant is on the top floor with superb views for miles around. Staff friendly and service was fast. This is a lovely hotel and i would be happy to recommend it. Stayed in Crown Plaza Dundalk on 21st April, Staff were v friendly and helpful. Rooms were beautiful, bed so comfy, we were on 8th floor, view was lovely. Breakfast de next morning was absolutely lovly. couldnt fault dis hotel in any way. hoping to take de kids nxt time for a little treat, with the cheap rates we cud afford to do dat!!! class hotel!!! Excellent hotel. Food was good, the room was lovely and clean. The staff were very helpful. Would look forward to staying again. Really enjoyed our night away. A nice, modern hotel with lovely comfortable rooms and tasty food. A great value break.